Goodness - it's the end of summer already! And kids are getting back to school. It's also time for the September CAS Mix Up Challenge! Bonnie is our hostess this month and she wants us to ink our stamps with markers! For my card today - I placed my Effulgent Penny Black stamp in my Misti along with a panel of watercolor paper and lined up where I wanted the image to print. I colored over the branch bit with my Gathered Twigs Ranger Distress Marker, spritzed lightly with water and pressed the stamp into the paper. (If you don't get enough color you can repeat the process.) Then I cleaned off my stamp and colored over the flower bits with my Shaded Lilac Distress Marker, spritzed with water and pressed the stamp onto the paper again. When I was happy with how it all looked, I removed the watercolor panel from my Misti and dried it with my heat tool. I stamped the sentiment from A Bit More: Butterfly Blooms Mini Set by PTI in black, added 3 tiny punched butterflies and some purple Tiny Twinkles. I brushed over the butterfly wings with Clear Glitter Wink of Stella. 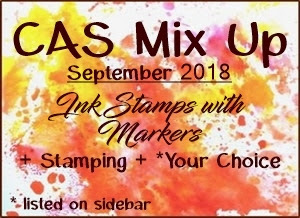 You will find several links to videos on inking your stamps with markers for your inspiration over at the CAS Mix Up blog - along with creative examples from the Design Team and our talented September Guest Designer - Chrissie (Simply One of a Kind)! You have until 9/24 to link up your cards - remember to keep them CAS by leaving a lot of clear space! I colored my stamp with markers than spritzed with water and stamped. Paper: Water color paper - Canson, Plum Pudding and Vintage Cream - PTI. Accessories: Ranger Distress Markers Shaded Lilac and Gathered Twigs, Misti, butterfly punch - Martha Stewart, Tiny Twinkles - Taylored Expressions, Clear Glitter Wink of Stella. So serene and lovely! I think this card is wonderful!!! Such a pretty thoughtful colored flower image, Julia. I love your sweet butterflies and tiny twinkles for embellishments, my friend. TFS Hugs..
Love these pretty lavender flowers with the tiny butterflies, Julia! 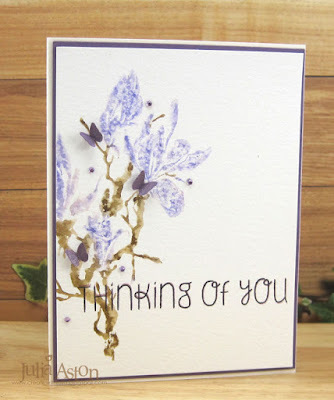 What a serene and beautiful watercolor card! 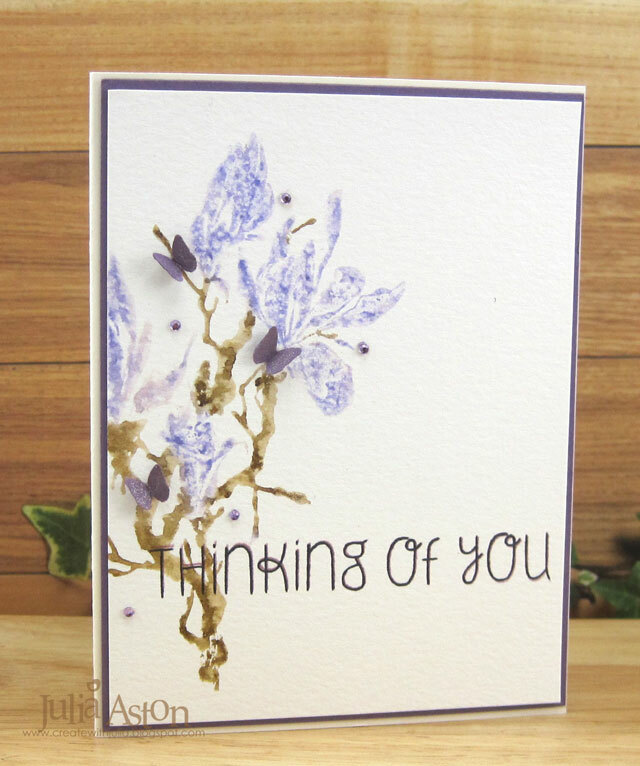 There's a wonderful soft dreaminess to the flowers - perfect for a "thinking of you" card. Love the tiny butterflies to add some dimension. I simply love the watercolour effect of this stunning creation Julia. The colours you chose are so delicate and suit the image perfectly! Julia your soft watercoloring is amazing on the petals of the flower and such gorgeous tones on the branch. Great addition with the tiny butterflies. Soft and pretty. I love the image this technique gives. Wow, Julia, what a terrific technique! I love the soft, watercolour effect. Thanks so much for joining our ATS&M Challenge this week.